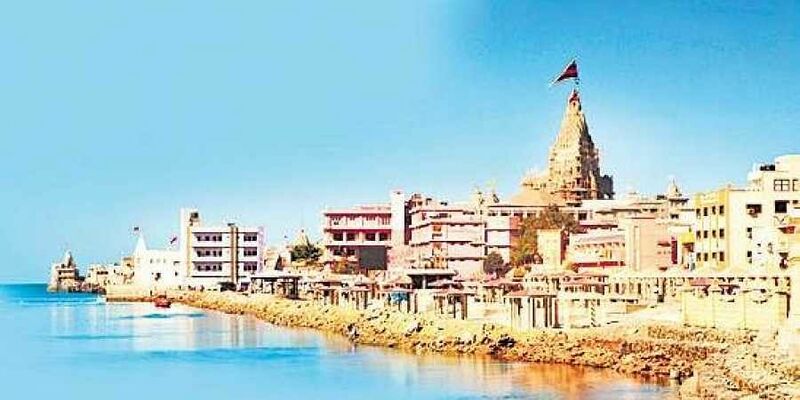 Dwarka has commanded much attraction because the site is one of the four Dhamas (sacred place for pilgrimage) of the Hindu religion. Dwarka has commanded much attraction because the site is one of the four Dhamas (sacred place for pilgrimage) of the Hindu religion. As the legend goes, Krishna founded the city in Gujarat’s west coast. The modern city of Dwarka, which in Sanskrit means ‘Gateway to heaven’, is located north-west of the state. Marine scientists say archaeological remains discovered 36 m (120 ft) underwater in the Gulf of Cambay off the western coast of India could be over 9,000 years old. It is believed to predate the oldest known remains in the subcontinent by more than 5,000 years. Carbon dating on debris recovered from the site, including construction material, pottery, sections of walls, beads, sculpture and human bones and teeth, put it at nearly 9,500 years old, making it older than the Sumerian civilisation by several thousand years. It is also older than the Egyptian and Chinese civilisations. The city is believed to be even older than the ancient Harappan civilisation. Dwarka is mentioned in a number of texts, including the Mahabharata, the Shrimad Bhagavad Gita, the Harivamsha as well as the Skanda Purana, and the Vishnu Purana. The Mahabharata says that Dwarka had 9,00,000 royal palaces, all constructed with crystal and silver, and decorated with emeralds. It was supposed to have been built on six blocks, two on the right bank and four on the left. Whatever has been traced so far conforms to the description to a large extent. The city was also extremely well planned: divided into six sectors which were in turn divided into residential, commercial areas. The city was home to beautiful large roads, gardens and artificial lakes. It is said that it was submerged in the big flood 9,000 years ago.